One of former President Barack Obama’s greatest foreign policy achievements is at risk, and it has nothing to do with his successor, said an Associated Press report on Sunday. Myanmar, the Southeast Asian nation that Obama helped usher back to democracy, has been roiled by an explosion of violence between Rohingya Muslim insurgents and security forces. Four hundred have been killed in the past week. 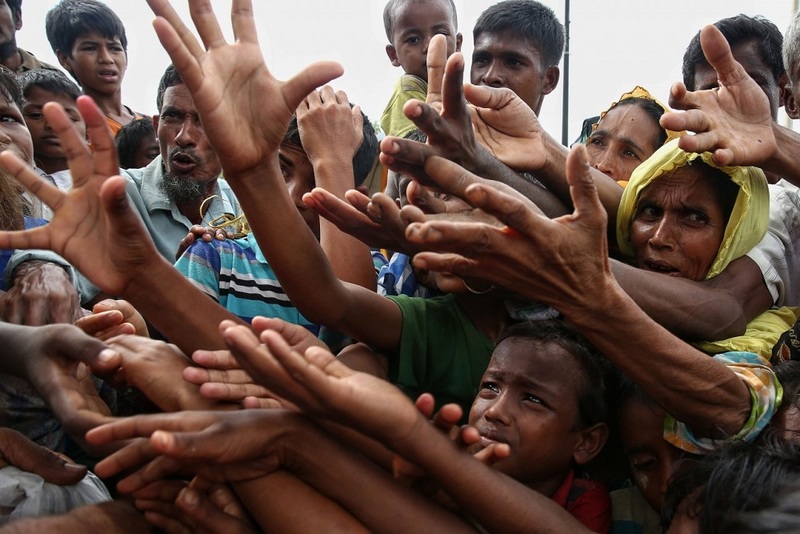 About 60,000 have arrived in neighboring Bangladesh, including tens of thousands crossing by boat and on foot in the past day, according to the United Nations’ refugee agency. The crisis has attracted unprecedented criticism of Aung San Suu Kyi, Myanmar’s civilian leader who once assumed an almost saintly status in Washington and other Western capitals. She met Obama several times and was long championed by Democrats and Republicans in the US for her long, peaceful struggle against military rule that culminated in her rise to power a year and a half ago ago. Myanmar’s troubles involve many factors, but none involves President Donald Trump. While he has tried to erase much of Obama’s overseas legacy, Trump has largely ignored Myanmar. Trump has yet to pick up the phone to speak with Suu Kyi. That has opened the door for northern neighbor China to exert greater influence. Beijing had ceded much of its sway to Washington after Obama, who visited twice, helped coax Myanmar’s generals to relinquish power. David Mathieson, an independent analyst based in Myanmar, said Washington and other Western governments lost their leverage in the race to abandon economic penalties when the country started to open up. They did so although the military remained entrenched in business and politics, controlling key ministries responsible for security and retaining a guaranteed quota of one-quarter of parliamentary seats. The military is now pushing for the president, who is subordinate to Suu Kyi, to convene a high-powered council with authority to grant it emergency powers to manage the crisis in western Rakhine state. Doing so raises further doubts about the country’s political direction. Suu Kyi is taking diplomatic fire for failing to rein in security forces over which she has no formal control in her position as state counselor. She is also being pressed internationally to do more to protect the Rohingya, who are accused by majority Buddhists in Myanmar of being in the country illegally even though many have lived there for generations. A former political prisoner, Suu Kyi opposed a UN fact-finding mission to investigate violence in Rakhine state. The UN Security Council this past week discussed the instability in Rakhine, from where civilians have fled across rivers and muddy rice fields, some on makeshift stretchers. Trump’s UN ambassador, Nikki Haley, condemned recent coordinated attacks by Rohingya on security posts, but she pointedly said government forces have a responsibility to avoid abuses and allow in aid. Lawmakers are also paying attention in Washington as they consider an incremental expansion in military ties with Myanmar, long taboo because of human rights abuses. Still, US officials past and present remain sympathetic to Suu Kyi. She faces a political dilemma, both in confronting the military and dealing with the turmoil that she inherited from the army-led administration that preceded her. Beyond the latest violence, Rakhine’s 320,000 Rohingya have been targeted in sectarian attacks by hard-line Buddhists for the past five years and live in squalid camps. Myanmar has faced ethnic rebellions in its border regions since winning independence from Britain nearly 70 years ago. Suu Kyi’s government also has struggled to peacefully end rebellions in the northern states of Kachin and Shan, targeted in military operations that have displaced tens of thousands, reported the AP. While her failure to call out military abuses has damaged her reputation, Suu Kyi, 72, remains popular at home. Journalists have been periodically jailed, and Suu Kyi herself has acquired a reputation for being aloof and controlling of information. But the country also known as Burma is far more open now than it was before its democratic transition. Its first free elections in a generation were won by Suu Kyi’s party in 2015. Hundreds of nongovernment groups involved in health, education and development have emerged. Young officials and economists are advocating changes. Mitchell’s greatest fear is foreign extremists capitalizing on the turmoil and fanning a worse conflict, giving the military a pretext to assert more control. “That’s a recipe for ruin,” he said.